10 Years Old – 2,000 Members Strong! Happy 10th Birthday to us! We’ve grown to 2,000 members strong on our Facebook group!!! To celebrate we want to give you a little history of babywearing in Chicago. Pay attention because there will be a quiz! (kidding!) People have been babywearing in various ways for centuries, but it is unusual to see carriers in modern western culture. Strollers came into fashion and babywearing went out. Now we are seeing a rise in babywearing love, and it is fantastic! Many, many years ago, not long after the invention of the Ergo, a group of plucky mothers decided to defy the norms of their time. The Midwest was a peaceful place of good manners, fried food and strollers. Caregivers of all kinds lived happily. It was a simpler time. Giant Graco strollers fought for room amongst a sea of running toddlers. If you needed to carry your baby, by God, you used your arms. Young children were tied to a line and marched from place to place. That is, until these fearless women paraded in with their spit up covered peasant tops, and against all odds, fought for the right to #wearallthebabies. Ok, it probably wasn’t that dramatic. There were baby carriers commonly in use in 2004 – pouch/bag slings, front packs, and framed hiking carriers probably being the most popular. You just didn’t see them much. The women mentioned above started the City Slingers back in 2004, and their group was small. They spread the love though! They got the word out and the message grew. By 2007, peasant tops were out of style, but babywearing was in! Lake County Babywearers was born as more Northsiders wanted to experience meetings but did not want to have to drive into the city for them. 2008 was a big year for the City Slingers – they organized themselves, trained their leaders and joined Babywearing International! Now with liability insurance, Babywearing International of Chicago became the first area BWI group and one of the first BWI chapters. Within a few years, both Lake County Babywearers and BWI Chicago were overloaded with requests all over the near Northside for meetings. The two groups had friendly leaders and an awesome idea. Why not merge (they were so close together after all) and have more leaders, a larger library, and the ability to serve more people. In 2011, BWI of Chicago and Lake County Babywearers merged and adopted the name name to BWI of Chicagoland. Though the Northside was taken care of, the Southside suffered. They wanted to wear, too! But to wander into Cubs territory? No way! Think of the children! It’s a long hike from the far south suburbs to the Northside for a meeting, so Babywearing South Chicago and Kankakee Area Babywearers were both born in 2012. It’s pretty incredible; they both have several hundred members now in just two years! Babywearing everywhere was growing by leaps and bounds. Where Babywearing International had only a dozen or so chapters a few years ago, they were quickly gaining to almost 50! Non-affiliated groups were popping up everywhere too. BWI of Chicagoland was now so large that it encompassed the city, north suburbs to WI, and they wanted to move west as well. It was a huge area and difficult for the leaders (who were spread out themselves), to accommodate so many eager people. 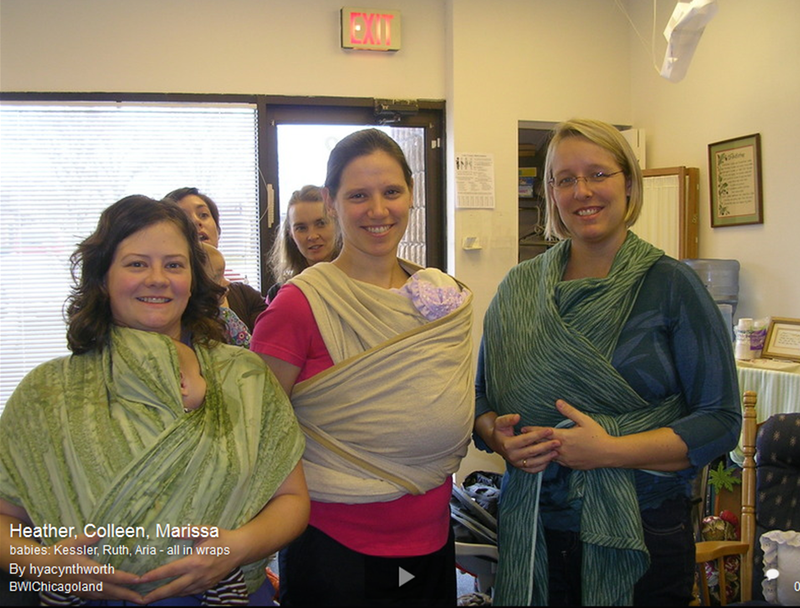 A few of the leaders broke off in 2013 to form Babywearing International of North Central Illinois to meet the growing needs of the area. It just didn’t make sense to try to cover such a huge area with only one group. North Central Illinois was able to pick up where the Chicago group left off and expand further to support more people. 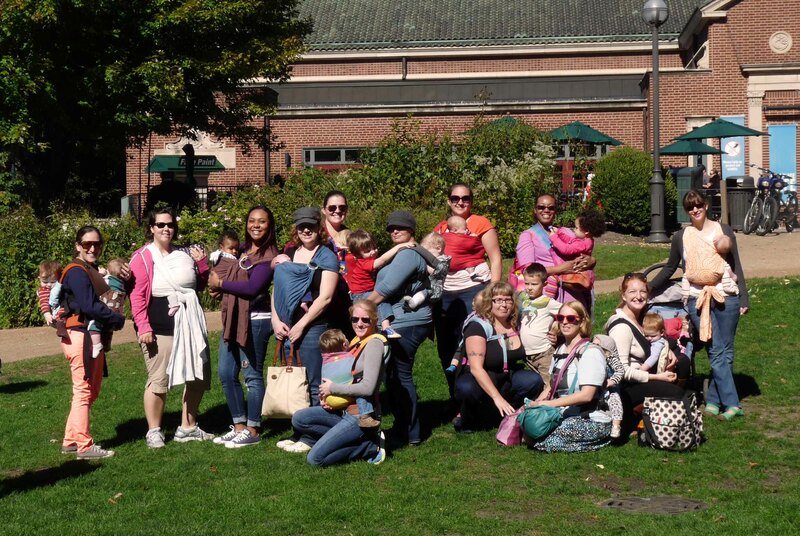 In May 2013, Babywearing International of Chicagoland had 845 members, a large amount that had quickly grown. Now, exactly one year later we are 2,000 members strong! Babywearing took off in this city in the past year, and we are in the process of training more leaders and adding more locations to accommodate our growing group. We couldn’t be happier with how fast and the group has grown – it’s more than doubled in just one year! Babywearing South Chicago is looking into becoming BWI affiliated as well, so soon we may have 3 BWI groups and 2 non-afilliated groups in the area! Altogether, we are serving more than 3,000 families! Keep spreading the babywearing love! Update: Since this post, both Babywearing South Chicago and Dupage Slingers have joined Babywearing International. So, they are now known as Babywearing International of South Chicagoland and Babywearing International of Dupage County.